High School class meets on Sunday, April 7. The following day, Monday the 8th, High School youth are invited to help serve dinner @ Oasis in Boston. 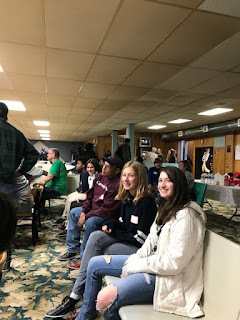 Many of the homeless or poor Bostonians who attend this monthly dinner love our chicken dinner and also love seeing young people they know from CityReach or our outreach events with Ecclesia. We leave St. John's by 3:45 and return around 7:30 p.m. There will be no Church School classes on Palm Sunday, April 14, and Easter Day, April 21. If you are not out of town for school vacation, please join us for these beautiful services, as well as for Holy Week services as you are able. On Easter Day we will have an Children's Sermon and an Egg Hunt! Please also bring in your mite boxes, as we will pull them down in the aisle in our red wagon and fill the wooden cross made especially for this Lent and Easter tradition! If you are away this Easter, no worries... we will collect the mite boxes after Easter as well. On Sunday, April 28, Church School classes resume for K- 5 and also for Middle School. Also on Sunday, April 28, from 1:30 - 3:00 p.m. at St. Paul's Cathedral, both Middle and High School youth have the opportunity to meet our wonderful Presiding Bishop, Michael Curry. (yes, this is the bishop who preached at Prince Harry and Princess Megan Markle's wedding!) Our partner parish, Church of the Holy Spirit, will be attending as well. Details will follow. Special blessings to you all for Holy Week and Easter! At this age-level, we connect scripture to the world around us, deepen our prayer lives, and integrate fully into different areas of parish life. High School class meets once a month, and there are at least one or two outreach opportunities monthly. Serving at at Oasis, Epiphany School, or tutoring at C.H.S. enable this age group to focus on living into our role as disciples. Many of our High School Youth participate annually in the CityReach program, run by Ecclesia Ministries, Boston. In June of 2017, we served in Copan, Honduras with our partner parish, C.H.S., working at two after-school programs. Confirmation Preparation class is held for youth in grades 9 and 10, in alternate years. Church School classes at this level meet twice a month, with students and their teachers joining families and friends at the time of the Peace so that they may receive Holy Eucharist. 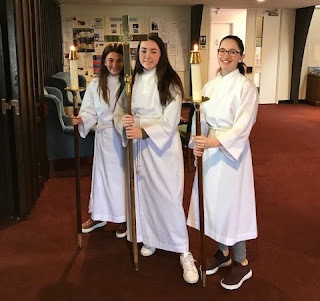 Youth in this age group are encouraged to begin participating as worship assistants (readers, acolytes, prayer leaders) during the 10:00 a.m. service on Sundays. 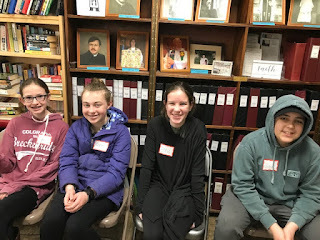 We volunteer on a regular basis at the Norwood Food Pantry. Weekly classes are offered for children age 5 and older, beginning at 10:00 a.m. on Sundays. Children and their teachers join their families to receive Holy Eucharist together. Ellen Stryer, our Nursery Care-giver provides loving care during our 10:00 a.m. service, September through June. She is assisted each week by a middle or high school youth volunteer. During July and August, we encourage parents to bring children to worship at 10:00 a.m.
Children of all ages are always welcome, year-round, to participate in all parts of our worship services. 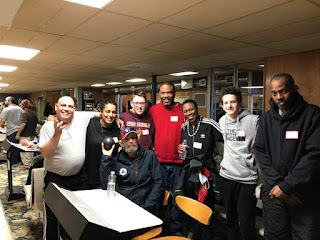 Above and below: High School youth offer a lively bowling and pizza party for Ecclesia Ministries of Boston!